The global village has undergone drastic changes this past century and a special generation gets most of that credit for its varied movements. Mimic monarch Rick Miller sets his sights on a 25 year span to bring it all into perspective in BOOM. Entertainer extraordinaire, Rick Miller not only subscribes to this lyrical school of thought he responds with a multi-media time capsule he refers to as a labour of love that revisits the political and cultural milestones that shaped the North American psyche. This is not the same staging that he unveiled during the winter 2015. Having performed the piece more than 325 times since then, BOOM has been retooled to now rely on three figures—mom, Lawrence and Rudi, to weave together the chronological events of the past. It’s a uniquely personal touch that gives the staging significantly more value in its delivery. 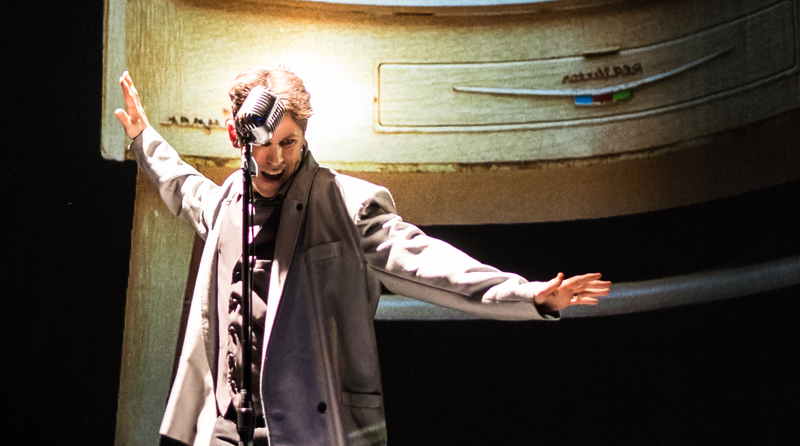 BOOM, on stage now for 5 short days, is the impersonation master at his very best cascading 100 characters throughout 25 years using stunning lighting/imagery design to revisit sequential episodes from 1945-1969 in a bold salute to an era that endlessly challenged traditional values and societal norms. You’ll be blown away by Act 1’s birth lottery foundation when the diaper industry flourished, builders built and consumers inevitably consumed during global political upheaval and a space race dominated decade that introduced us to cartoon icon Bugs Bunny, news anchor legend Walter Cronkite and, of course, music culture beacon Ed Sullivan. The second half of the show scratches the surface of generational conflict and the misunderstanding of the seeds of change. JFK, the Berlin Wall, birth control pills, and entry into adulthood take centre stage as do a myriad of rock-n-roll idols for added thrills. It’s hard to believe a modern day artist could feel such a deep connection in understanding Baby Boomer delicacies yet Rick Miller has forever viewed the world through a unique lens that magnifies the things that the rest of us take for granted. A ceiling high cylinder set environment with his pitch perfect impersonations gives this offering full scale documentary appeal. Musical interludes including ‘Blue Moon,’ ‘Hound Dog, ‘Locomotion,’ ‘Eve of Destruction,’ ‘My Generation,’ and ‘Space Oddity’ provide a riveting soundscape to revolutionary climaxes of the mid- 20th Century. It’s polished, purposeful and oh so pleasant to observe. While it’s speculative if a retired generation looks back on its continental contribution knowing that they matured throughout one of the most fascinating moments of our time, no one can argue—wasn’t that a party? BOOM is an exquisitely entertaining history lesson that curiously—but not surprisingly—secures new found optimism. And with Rick Miller’s follow-up work placing Generation X under the microscope due shortly, the future’s looking so bright you just gotta wear shades.